Few creators in comics work their magic with youth movements quite like Brian Michael Bendis. And few creators like Bendis have managed to drive away much of the consumers in the near 2 decades he's been souring the milk of superhero comics. During his almost two decades as one of the top writers at Marvel Comics, Bendis ushered in the biracial Spider-Man Miles Morales (co-created by artist Sara Pichelli). But before that, he had to kill off the teenage Peter Parker/Spider-Man he’d written for Marvel’s Ultimate Comics line. The news was devastating to pre-Miles fans. Making Spider-Man into a Spider-Kid had been a big hit once before. Could he pull off the same success twice? So when Bendis started having top-secret meetings with DC Comics co-publisher Dan Didio in Los Angeles to discuss one of the biggest free agent splashes in a comic-book generation, the question of DC’s teen heroes came up. Oh, isn't that laughable. Mainly because DiDio destroyed much of what made their teen heroes work, with Robin one of the biggest victims, starting when Batman's War Games crossover took place. There was also Geoff Johns' Teen Titans, which alternated between badly written nostalgia and, like several other writings of his, irritating allusions to sexual abuse, including the forced battle with Doctor Light. Apparently, Identity Crisis was written up all so they could contrive a "reason" for Arthur Light's supposedly becoming a goofball, ignoring how Psimon terrified him out of his skin in the New Teen Titans/Outsiders crossover tale. At best though, the whole idea Light was literally incompetent was hugely exaggerated, and if the writers wanted to, they could've ignored any and all later stories with the sloppy direction if that's what it took to depict Light according to their idea of what makes an effective, formidable villain. Didio decided in that moment that Bendis was the guy to bring back Young Justice — a junior Justice League with a roster of teen DC favorites that includes Robin the Boy Wonder (the Tim Drake version), teen Superman clone Superboy (the 1990s version), super-speedster Impulse and Wonder Woman protege Wonder Girl. The plan was to create a new youthful imprint, called Wonder Comics, built around a new “Young Justice” series, which originally debuted at DC in 1998. So Bendis was the man for the job? Not Peter David, who wrote the 4-5 years of the original title starring the teen heroes spotlighted? Well, that figures. Not that David's without his faults, recalling his ill-advised strikedown of Betty Banner at the end of his Hulk run in 1998. But he had more of a sense of humor, and one that worked far better than any of Bendis' crude elements ever have. And whatever fun David brought to the table was thrown away when Johns dumbed down the TT with his annoying approach (the way he wrote Cassie Sandsmark, the 2nd Wonder Girl, was noticeably awful). 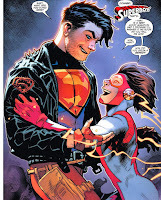 Two years ago, after Bendis announced his arrival at DC, he was flooded with social media pings from fans asking to bring back not only “Young Justice” but also Conner Kent, the Superboy spawning from the now-classic “Death of Superman” and “Reign of the Superman” story lines of the early 1990s. Why must anyone even bother talking to Bendis? He's never apologized for maltreatment of Scarlet Witch and the House of M crossover at Marvel, or boasting about breaking other peoples' toys, or even Civil War, which he was part of planning, so I don't see why anybody would think he'll be any more appealing as a writer today. The Wonder Comics imprint debuted last week with the first issue of “Young Justice,” written by Bendis and illustrated by Patrick Gleason. And the return of the 1990s Superboy is the biggest moment of the launch so far. Bendis realizes much of the initial attention of Wonder Comics will be geared toward the return of the cocky clone Conner Kent/Superboy, a [favorite] character with many fans despite being away from DC continuity for some time. “Young Justice” will explore where Superboy has been. Bendis will also oversee the retro-nostalgia-fueled “Wonder Twins” (written by Mark Russell and art by Stephen Byrne), “Dial H for Hero” (written by Sam Humphries and art by Joe Quinones) and a new heroine in “Naomi” (written by Bendis and David F. Walker and art by Jamal Campbell). Say, isn't that the same Walker who insulted whites and used vulgar language while he was at it? And exploited the Avengers for Occupy-style propaganda? And the white, SJW-pandering Bendis has no problem with that? Gee, shows just how far morale's fallen. Wonder Comics is intended for new readers, but Bendis recognizes that adults who grew up loving characters such as Superboy, Impulse and Robin in the 1990s will probably be interested in these adventures. He says readers new and old should be satisfied. But don’t let the nostalgically designed superhero suits fool you: These stories take place in the here and now. Wrong. We're just interested in the old adventures, including David's 1998-2002 series. Besides, like I said, those older ones were more amusing anyway, and that's more than can be said about whatever Bendis brings to the table. And, with Bendis' numbers doing so dismally on Superman, one can't expect him to draw in new readers at any more ease on a new YJ. Not if Bendis is at the helm. DC's continuity has been so damaged (last time I looked, Cyborg was still cut off from the Titans), that whatever he's boasting doesn't matter. Balancing out the return of so many fan-favorite characters with Wonder Comics is the creation of a new one: Naomi, a young girl of color in a Pacific Northwest neighborhood where nothing ever happens, yet she is somehow connected to the one time something (involving superheroes) did happen in her town. I'd like to think it's great if he's creating new characters to fulfill his ideas of entertainment. But Bendis is so pretentious, this is unlikely to work out either. Being allowed to freely create new characters at DC reminds Bendis of the time comic-book legend Jack Kirby came to DC in 1970 after years at Marvel and created the Fourth World, which resulted in the making of the New Gods and one of DC’s greatest villains ever, Darkseid. As for the eventual Naomi/Miles Morales comparisons, and whether Bendis can strike creative lightning twice bringing a new character of color to a major publisher, he says: Stay tuned. If there's one thing not many will see his work on YJ as, that's exciting. Or, not appealing. What more can one expect from a man who even wrote the Flash talking like a toddler last year in his Superman run? There are, I'm sure, writers who can introduce new characters to the DCU and MCU on a respectable basis, but Bendis isn't one of those, and the only reason at this point why he's getting the job is because he's considered part of the establishment that's led to the Big Two turning into enclaves for a select few. I've read some of the YJ written by David in the years before his career faded, and there, they had some good comedy and even 4th wall-breaking, stuff you couldn't expect Bendis to come within even miles of duplicating with his pretensions abound. That's why it's better to just stick with the old, so long as DC's held hostage by these kind of people, and not finance the new. "I'd like to think it's great if he's creating new characters to fulfill his ideas of entertainment. But Bendis is so pretentious, this is unlikely to work out either." Bendis does do this but he never did it with the goal of building an audience for his creator-owned work bendis. They were glorified movie pitches. Like many people in comics, Bendis failed to make it somewhere else. In Bendis' case, he is a failed screenwriter. Bendis makes his bread and butter working on other people's properties Like a good corporate tool, he pretends his tokenism of black or female characters is organic and exceptional and is not something coming from his bosses , and his bosses' teachers, the liberals who control the educational system. There is nothing grassroots and organic and "speaking to power" about social justice when the vast majority of wealthy people who derive their wealth from globalization are the biggest supporters of social justice. Actually, let's not. It just shoves in your face the long-standing bigotry behind the sjw acronym. Kitty Pryde was jewish from when Claremont and Byrne first introduced her back in 1979; she has never been anything else. "When did Peter Parker convert to Judaism?" Apparently, because Stan Lee , Dan Slott, and Peter David are. "More important, perhaps, is the evidence right there on the page. Peter Parker doesn’t just sling webs, he slings zing. The Parker patter, as written by Stan Lee and other legendary Jewish writers like Brian Michael Bendis and Peter David, is an endless stream of yiddishe schtick that livens up the action." Although, Bendis' response seems jocular, it can turn into something more serious. There are tweets on Twittter where readers find (ulitmate?) Parker sporting Jewish slang. "Kitty Pryde was jewish from when Claremont and Byrne first introduced her"
It was never a major part of her character like Nightcrawler's faith was. Bendis brought it up for the same reason why he is writing black female characters everywhere. "Comics are a reflection of the (his) real world". In Bendis' real world, a character's identity is a huge part of how they see the world and how they relate to others. Superman was transformed into a Christ-like character by Christians. He was Christianized and Bendis sees it as his task to bring Superman back to his Jewish roots. "only a Jew like Bendis can truly understand what those kids from Cleveland envisioned. That very truth is what has pushed us so far away from the center to begin with. An entertainment industry dominated by Christian white men has caused Superman's message to fall off the rails a bit." Was Bendis a pioneer of the forced and unnatural interracial relationships seen in the arts, or did he read the signs on the Social Justice wall that said, "white heterosexual couples art problematic"
"Actually, let's not. It just shoves in your face the long-standing bigotry behind the sjw acronym"
and social justice is driven by actual hatred of women for men, blacks towards whites, gays towards, straights and so on. Most sjws are not the live and let live type. Younger liberals routinely use race and gender to attack and dismiss people they don't like in ways that are alien to older liberals. What all those lines suggest is that Peter is somehow Jewish in spirit and style, even though he is not of the Jewish faith, and that he was so from the beginning, long before Bendis ever started writing about him. So saying that this shows Bendis turning a pet character Jewish, as cyber smooch mike said in his earlier post, is completely wrong. Kitty's faith was an important part of the X-Men stories almost from the beginning. Look at issue 150 from 1981, where it was essential to the plot and marked a major turning point for the evolution of Magneto's character. "Was Bendis a pioneer of the forced and unnatural interracial relationships seen in the arts, or did he read the signs on the Social Justice wall that said, "white heterosexual couples art problematic""
"Forced and unnatural" interracial relationships have been part of comics since Princess Fen met Capt McKenzie back in 1920 or so. Since then we have had m'Shulla and Carmilla, Danny and Misty, Peggy and Gabe, Ororo and Forge, .... Bendis is hardly a pioneer - he is a Johnny-come-lately. And in real life, of course, interracial relationships go back a lot further and are far more common. Don't forget the early DC inter racial relationships, like Brainy and Kara, or Mon-El and that Talokian girl. Forced and unnatural refers to the relationships not being believable because of they way they are portrayed: characters with nothing in common are not going to form long-term relationships in the modern times. Luke Cage and Jessica never felt natural. They both came from very different walks of life. The only thing that binds them together are the liberal views of the writer shipping them. interracial couples are rare compared to same race couples. In wealthy liberal enclaves, there tends to be more race-mixing than in in the general population. The idea that what's happening in a cosmopolitan, liberal enclave can be generalized to say that is "the future" of humanity is laughable given the painfully low birth rate in those areas and the fact that people still cluster around those who are the same race as themselves there, no matter how liberal they claim to be. Kitty's faith was an important part of the X-Men stories almost from the beginning. " No, they were not. Stop lying. I'm guessing you ignored all of Dr. Light's appearances between New Teen Titans and Identity Crisis? He fell quite a long way from his days battling the Justice League. Also, Bendis is a hack who never wrote anything good in his life, PAD has a tendency to go overboard with his creator's pets (like The Foreigner), Kitty is a bad character and (unfairly) became the focus of many X-Men storylines she shouldn't have been, and guys like Synder, Hickman, Fraction, Ewing, and Slott don't know how to write non-pessimistic books. "Luke Cage and Jessica never felt natural. They both came from very different walks of life. The only thing that binds them together are the liberal views of the writer shipping them." and that "The idea that what's happening in a cosmopolitan, liberal enclave can be generalized to say that is "the future" of humanity is laughable..."
Interracial marriage may not be the wave of the future of humanity; but it is likely that we will soon reach the stage where it will not stir up any more fuss than any other kind of mixed marriage, say Scottish and German or Catholic and Protestant. We are already at the point where marriage between republican and democrat is more problematic than between black and white. Jessica and Luke became a couple because they had a child together, not the other way round. But they do have a lot in common. Superpowers and regular participation in combat, for one thing, and a sexual chemistry from the beginning that neither wanted to accept, but they also shared the same kind of ugly experience that was so formative for each of them; they both know what it is like to be a victim, to be helpless and degraded by someone who has all the control over you. Luke in prison, Jess by Killgrave. They recognize that in each other. They are both tough on the outside and marshmallows deep down. I didn't like Bendis' Cage at first; he looked like a pimp and talked like a moron. But fatherhood changed the guy. He is a lot more decent now. "No, they were not. Stop lying." You should also take a look at X-Men 199, from 1985, where Kitty attends a meeting of survivors and their families and talks about her grandfather who survived the concentration camps. Or: yes it was so. Stop ranting and start reading. Kitty Pryde's Jewishness was NEVER part of an important part of the X-Men stories almost from the beginning"
Jewish persecution was a major part of Magneto's motivation. Stop lying. Motivation from Claremont onwards perhaps, but not before then.